Here, we provide practical tips on how to avoid road rage - as well as some startling stats, common reasons that cause road rage and wisdom from experts - to ensure your safety while driving. 1. Move over if someone is tailgating you. 2. Use an "I'm sorry" gesture (e.g. wave) to attempt to defuse the situation. 3. Plan ahead; allow time for delays during your journey. 4. Consider whether you've done something to annoy the other driver and adjust your driving accordingly. 5. Listen to music you enjoy. 6. Use your horn sparingly. 7. Avoid eye contact with angry drivers and give them plenty of room. "If we can put ourselves in the shoes of other drivers, we are more capable of understanding their behavior and staying calm. If we can't appreciate their situation, then we are more likely to get offended, angry and even rageful if their driving bothers us." - Dr. Robert Nemerovski, psychologist specializing in anger and anxiety. "There's a lot of talk about driving under the influence, and oftentimes people are referring to drugs or alcohol. But people are driving under the influence every day - and that influence is rage." - Shannon Munford, anger management expert. Aggressive driving plays a role in 66% of traffic fatalities. 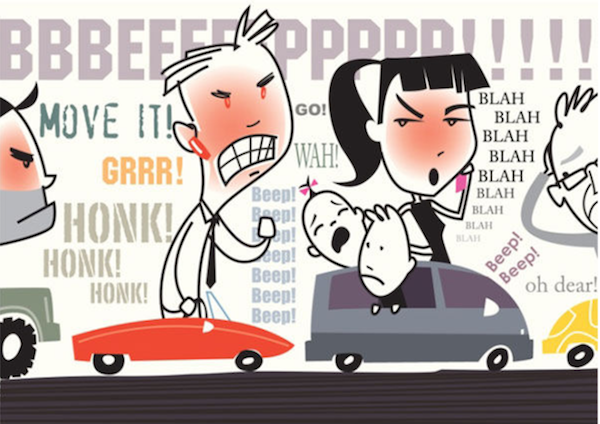 50% of people who encounter aggressive driving behavior respond in kind. A firearm is involved in 37% of aggressive driving incidents. Out of 10,000 road-rage incidents committed over a seven-year span, there were 218 deaths and 12,610 injuries recorded. "Some good people have bad days and end up in situations they normally never would, simply due to powerful emotions like anger, frustration and stress taking over." - Richard Senshido, self-defense expert on de-escalating situations with road ragers.